James Neal helped lead Nashville to its first Stanley Cup Final. And now he may be headed to Las Vegas. An expansion draft is more or less the NHL’s answer to a yard sale. The items on offer are inexpensive and potentially of no interest to anyone. Or, they are overpriced baubles that the owner wants to get rid of because they take up space in the house. Whichever type of players the brand-new Vegas Golden Knights select on Wednesday will begin to shape the brand-new team’s roster. The team will take one player from each NHL team in the league’s first expansion draft in nearly two decades. This week, the 30 existing franchises submitted their protected-player lists — teams could shield a designated number of players from the draft1 — and the Golden Knights will get their pick of the rest. It remains to be seen if any of those gambits end up working. For what it’s worth, most of the various online mock drafts call for the Golden Knights to focus mainly on relatively young, inexpensive talent — aside from the popular picks of goalie Marc-Andre Fleury, forward James Neal and defenseman Marc Methot (each of whom will be 30 or older when the season starts and not particularly cheap). The Knights are also reportedly accepting trades that will net them draft picks in exchange for avoiding certain players in the expansion pool. The strategy of building a team from scratch is always fascinating, particularly for the first expansion club of the salary-cap era. If Vegas is anything like its expansion ancestors of the 1990s and early 2000s, it won’t be very good in its inaugural season. The average expansion club since 1991 won only 34 percent of the points available in its games and was outscored by 1.0 goals per game. But those teams have also occasionally managed to snag some pretty good players in the expansion draft, both in terms of skaters (Brian Bradley, Geoff Sanderson) and between the pipes (John Vanbiesbrouck, Guy Hebert). Just as Fleury lost his job in Pittsburgh to Matt Murray, Vanbiesbrouck became expendable to the New York Rangers with the emergence of Mike Richter. Twenty-four years later, maybe the Golden Knights will find similar steals with their picks Wednesday night, turning Fleury into the next Beezer. Specifically, they were allowed to protect either seven forwards, three defensemen and one goaltender, or eight skaters and one goaltender. 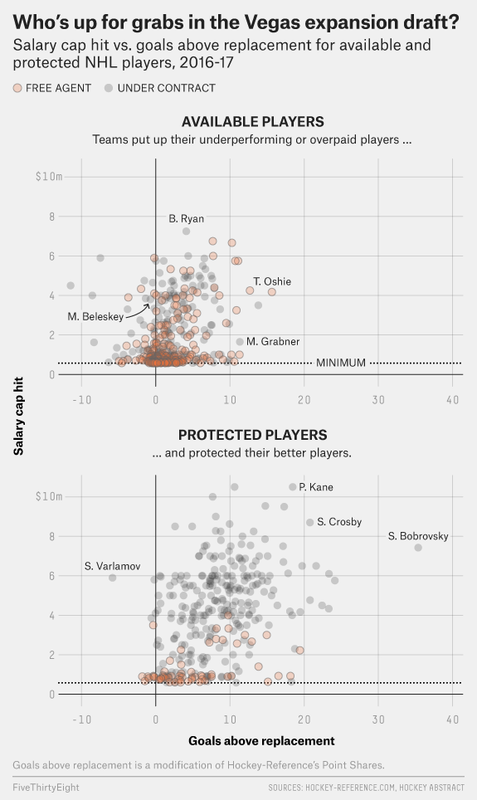 A modification of Hockey-Reference’s Point Shares that is set against the league’s replacement level and scaled to the same range of values as Hockey Prospectus’s Goals Versus Threshold. Any mention of which carries the obligation to note that, ironically, the New York Knicks didn’t use their amnesty on Houston. They waived Jerome Williams instead.